Alice Phelps and Fred Feeney met through the wonderful Bacon Street musical Sunday sessions. Since then have been getting a steady jazz and blues repertoire together with Fred on piano and Alice on vocals. Fred is a wonderful stride pianist with beautiful light inflections throughout his playing. Alice is a Multi-instrumentalist usually found to be singing behind the harp, piano or guitar, so enjoy this one off with her just performing vocally. Fred Feeney is a composer, arranger and pianist. After graduating from Trinity college of Music he toured the world working as a musical director for Royal Caribbean and other acts. Fred now lives and works in London performing steadily in the London underground blues and jazz scene, often found with other members of the Gator Dog Snappers and occasionally found playing trumpet too. Alice Phelps: Alice can be found in many London basements, clubs and festivals fronting the New Orleans Trad band the Gator Dog Snappers. With a monthly residency at the Magic Garden Pub in Battersea you can hear Alice exploring the delights of many wonderful blues musicians, mainly the likes of Bessie Smith and Memphis Minnie, always joined by top quality musicians. 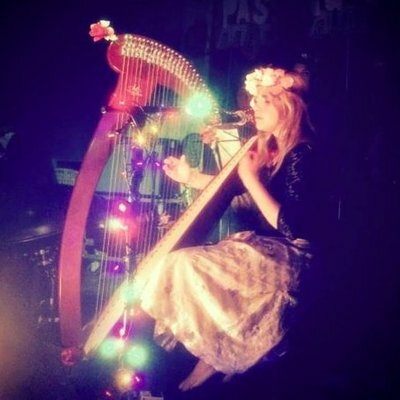 She is also a multi-instrumentalist and leader of an ethereal harp centric collective, with music influenced by folk from near and far, Irish to Chinese, Alice blends this with non traditional and blues infused melodies. Creating ambient, lilting, rhythmic harmonies with the harp allowing the bellowing husky vocals to be perfectly contrasted in a very unusual but beautiful way!